North of Madrid, between the city and the Sierra de Guadarrama mountain range, lies the Cementerio de Fuencarral. The cemetery was built to bury the fallen of the Battle of Jarama, which began on 6th February 1937, exactly 76 years before my visit. After the Nationalists declared victory in April 1939, Franco disinterred those who had died at Jarama and disturbed the graves of many International Brigades’ members buried there during the course of the Spanish Civil War. Although the entire cemetery was not demolished and the initial walls still stand, the Republican burial plots were removed and the original remains ending up dumped in an unmarked mass grave. 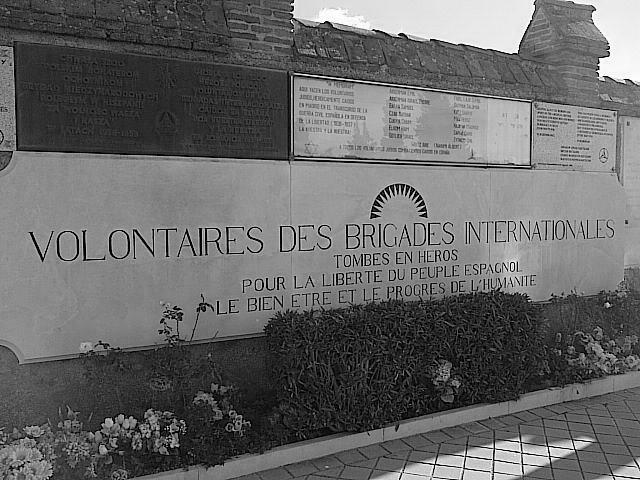 A large plaque honouring the International Brigades was also destroyed. The sheer brutality that brought the cemetery into being and governed its early years is now hard to imagine; but its history has not been forgotten. An annual service is held to commemorate the fallen of Jarama, and a new plaque dedicated to the International Brigades was unveiled in 2009. The purpose of my visit to Fuencarral was the vain hope of finding the grave of Julian Bell, son of the painter Vanessa Bell and the art critic Clive Bell, and the nephew of Virginia Woolf. Bell had left for Spain in June 1937 only months after his return from China, where he had spent nearly two years teaching English at Wu-Han University. After two failed attempts to gain a Fellowship at King’s College, Cambridge (his alma mater) Bell turned his attentions abroad in the hope of achieving the recognition that had eluded him at home. He had enjoyed minor success as a poet and writer, but without the level of acclaim he desired or, because of his Bloomsbury connections, expected. However, Chatto & Windus expressed interest in his work and in June 1930, Bell received a letter from them informing him that they wished to publish some of his poems. His first volume of poetry, Winter Movement, was published that year. In 1932, the Woolfs decided to include his poetry, along with that of W. H. Auden, Cecil Day-Lewis, Stephen Spender, and William Plomer, in a collection entitled New Signatures. Virginia Woolf also published her essay “A Letter to a Young Poet”, that same year. Woolf felt that, the problem with modern poetry was that it, ‘shirked contact with — what shall we call it? — Shall we shortly and no doubt inaccurately call it life?’ and implored these young poets, ‘for heaven’s sake, publish nothing before you are thirty.’ Ironically, Bell would die at the age of 29. By 1933 poetry was being eclipsed by politics, as far as Bell was concerned; although he never became a Communist like many of his Cambridge contemporaries. Bell believed instead that it was, ‘not really possible to experience personal salvation by conversion to Communism.’ In a letter to the New Statesman Bell tellingly revealed, ‘In the Cambridge that I first knew, in 1929 and 1930, the central subject of ordinary intelligent conversation was poetry. As far as I can remember we hardly ever talked or thought about politics.’ However, in the years that followed, politics would become a growing preoccupation for Bell. In the November of 1933 for example, he took part in an anti-war Armistice Day rally through Cambridge; but political developments in Europe would inevitably cause him to redefine his attitude towards warfare. In 1935, shortly before he left for China, Bell edited We Did Not Fight 1914:1918, a collection of the memoirs of war resisters whose contributors included Siegfried Sassoon and Bertrand Russell. In the book’s introduction Bell declared, ‘I believe that the war-resistance movements of my generation will in the end succeed in putting down war – by force if necessary.’ With these words, he ideologically distanced himself from the Pacifism espoused by the Bloomsbury Group. Gazing out at the rocky terrain surrounding Fuencarral, with the blanched earth of the cemetery underfoot, it was impossible not to think about this decision and how Bell would eventually pay for it with his life. On his return to England, Bell’s family noticed that he had been changed by his experiences in China and his struggle over whether to go to Spain was noted by Virginia Woolf in her diary. ‘I felt him changed: taut, tense, on the defensive.’ For Bell the Spanish Civil War was crucial in that a Republican victory could halt the spread of Fascism across Europe. Few people realise just how mechanised the conflict in Spain was, and how bloody the fighting, with both sides receiving heavy casualty figures even by the standards of the later conflict that would soon engulf Europe. On 15th July 1937 an explosion destroyed Bell’s ambulance. Consequently, he volunteered as a stretcher bearer and received a replacement vehicle from the British Medical Unit three days later. During the Battle of Brunete, his ambulance was hit by a Nationalist bomb as he drove along a road just outside Villanueva de la Cañada. The doctor who treated him, Kenneth Sinclair-Loutit, remembered that Bell had sustained, ‘a massive lung wound’, while repairing his ambulance in an area that was being subject to a Luftwaffe bombardment. ‘His case was beyond hope.’ Bell was moved to the military hospital at El Escorial. Reginald Saxon, a doctor who treated him remembered, ‘His heart was visible through the wound…we realised we had to let him die and he died that night. When he saw me all he said was, “Thank goodness it’s you.” And I gave him morphine.’ According to Peter Stansky and William Abrahams’s biography, Journey to the Frontier, Bell murmured to Cochrane, ‘Well, I always wanted a mistress and a chance to go to war, and now I’ve had both’ before slipping into a coma. He never awoke. Though Vanessa Bell took great comfort from the letters of condolence that she received in the days after her son’s death; Richard Rees, who had also been in Spain with Julian wrote to her recalling, ‘how perfectly adapted he was to all the difficulties and strangeness, and how assured and serene and brilliantly competent he was.’; the Bloomsbury Group struggled to come to terms with Bell’s loss. Virginia Woolf was haunted by it until her suicide in March 1941. However, they took consolation from the fact that he had received a proper burial, and his own plot at the Cementerio de Fuencarral, unlike many of the other British International Brigade volunteers killed in Spain (estimated to be around 525). An exchange of letters between Vanessa Bell and her son’s closest friend Edward Playfair, suggests that by 1940 the grave still remained intact, although the cemetery was now becoming vulnerable under Franco’s regime. In all likelihood, the Second World War and its aftermath hampered efforts to secure the plot as there is no further information as to what became of it. The little I had discovered about the cemetery and its history led me to believe that any effort to find Bell’s grave was probably futile. It seemed likely that it had been lost for decades and I scanned the cemetery for an English name or relevant date, but found nothing. Shortly before his death, Bell wrote to his mother from Spain. He spoke enthusiastically of the military efforts he was engaged in, the people he had met and how he believed his decision to go had been the right one, telling her, ‘I find myself at home.’ He had found what he was seeking during the final years of his brief life and the contentment he felt in Spain along with the ideals for which he and so many others fought and died is of far greater importance than the location of his grave. Wherever it may be, he’s undoubtedly still home. The Papers of Julian Heward Bell, King’s College Archive Centre, Cambridge. Dr Reginald Saxon Obituary, The Independent, 6th April 2004.